There are two golden rules for the citation of legal authorities. One is consistency. The other is consideration for the reader. Legal writing is more persuasive when the author refers to legal materials in a clear, consistent, and familiar way. 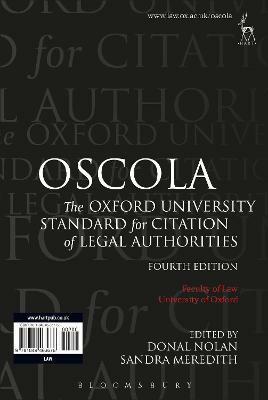 The Oxford University Standard for Citation of Legal Authorities (OSCOLA) is designed to help legal authors achieve consistency and to make life easier for the reader. OSCOLA does not purport to be comprehensive, but gives rules and examples for the main UK legal primary sources, and for many types of secondary sources. As far as possible, the guidelines in OSCOLA are based on common practices in UK legal citation, but with a minimum of punctuation. This fourth edition provides more detailed coverage of domestic legal sources. In particular, the treatment of Welsh, Scottish, and Northern Irish sources have been considerably expanded. It will be an essential tool for anyone citing legal authorities.